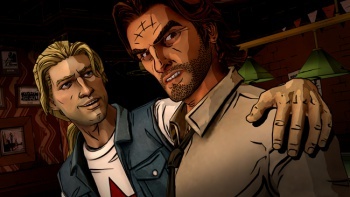 Telltale promises work on the game is being wrapped up this month, with a release announcement to follow soon. In anticipation of the upcoming release of Smoke and Mirrors, the second episode of The Wolf Among Us, Telltale Games has released some new screens and info. Among these is the reveal of supporting cast member Jack, "of beanstalk fame," whom you might remember as the lad who broke into a giant's house and made off with his loot. Telltale's blog describes Jack as "a sharp-tongued rogue," though it doesn't go into any other detail about what role he'll play. Jack has been a regular character in the Fables comics the game is based on, including getting his own series, Jack of Fables. The blog post also showed a picture of a seedy, Fables-only nightclub called the Pudding & Pie, with Bigby staring down a tattooed street tough. A release date wasn't announced yet for the new episode, with Telltale's post only saying that their team is finalizing the game this month and they hope to have an estimated release time soon. The announcement was set to coincide with the recent arrival of The Wolf Among Us on iOS. Telltale will be launching the second season of its critically acclaimed Walking Dead series later this month on Dec. 17.